Remember when I was mumbling about an app to do smart lists for habits and repetitive events? Well, let’s move deeper from here as I just came up with its first layout. Ok, at first you’ll want to bash my hand on the corner of your desk and shout at me due to my use of textures and, seriously, a bunch of tiny effects. At first, I wanted to create something distant from my previous layouts for Better, which now I see as a quite safe option. I wanted to take a risk and move against the stream as I carry a certain pessimism that full-flat design will make every app look the same, as following the actual Apple’s UI guidelines does nowadays. Plus, I was bored, mainly with the recent Sketch mass acquisition and how it has been used mostly for flat designs, you know, change the scenery a little bit. Have you ever been home from the grocery store and realized that you forgot about an essential item? "Now & Then" can help you remind that. "Now & Then" is responsible for dealing with repetitive tasks, it is not a task-management tool. 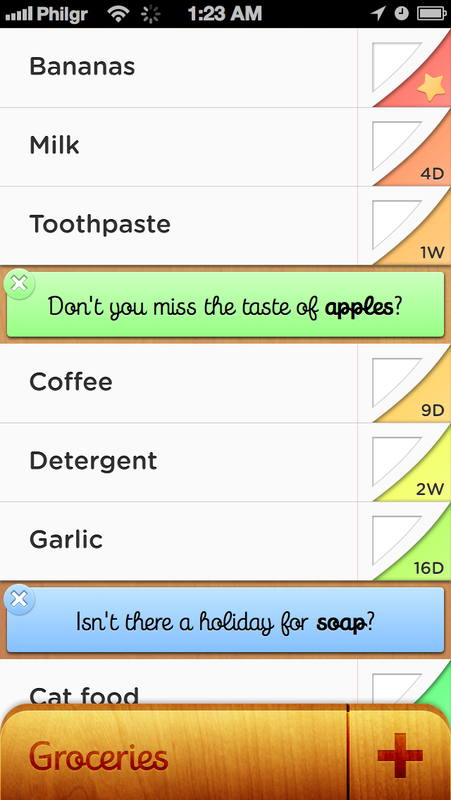 Picture it as a reminder app, one that generates the intervals between each task according to how much you use it. "Now & Then" memorizes every time you perform a task and creates an average, allowing it to suggest the next time you're out of, for example, bananas. 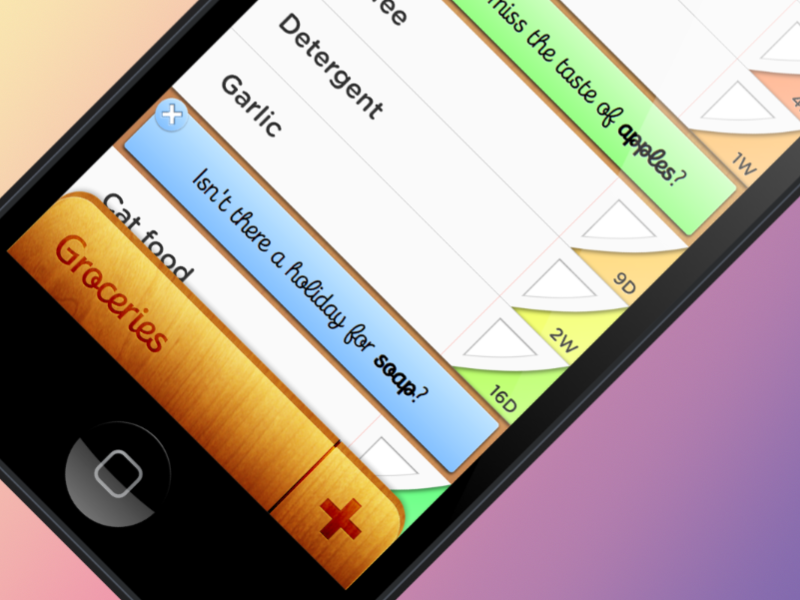 It is the perfect fit for grocery lists, but it doesn't stop there. How long ago did you cut your hair? Is it time to visit the hair dresser again? "Now & Then" would remind you to give yourself a better treat. It is about remembering those things that are essential for us to keep going. Starting from right to left, that peculiar 112x112, the colored part indicates 'how long to the task to come' and the star indicates that it is due today. The color palette is a theme. It is analogous according to the first red, spanning on 180º through the color wheel with 21 tones (covering 3 weeks, yet expandable up to 180 tones, of course). At first I was including a peel effect to that, but decided to go less. To reduce the collision of gestures, I decided to include a checkbox for done items. For a better space management, I decided to add it as you can see in the drawing. I find it different, yet effective. Technically, the whole 112x112px area is clickable. I was decided to go skeuomorphic, actually, more of a fakeuomorphic as every added element has more of a decorative purpose than anything. The red stroke is toned according to the top color of the theme, so it may be red now, blue later, it depends. There are no due tasks, because Now & Then is supposed to help with your memory, not to demand it. So if an item goes due, you'll see those tooltips suggesting their inclusions to the list. Now that I thought of, I'm missing a way to simply ignore the tooltip. The color palette here is also different, yet consistent. Same hue and brightness with changes exclusively on saturation. Now the wood texture. I wanted to make this app feel cozy, you know? Besides, I wanted to try something different, specially as I was working on Sketch and every damn design I see made from it is done as flat. I can only hope that you appreciate the "end" product as much as I do. Oh, no navigation bar, as you may have noticed. It is easier to reach the bottom of the iPhone screen and I didn't have use for much navigation, so I decided to try this out according to the way I often visualize my phone.